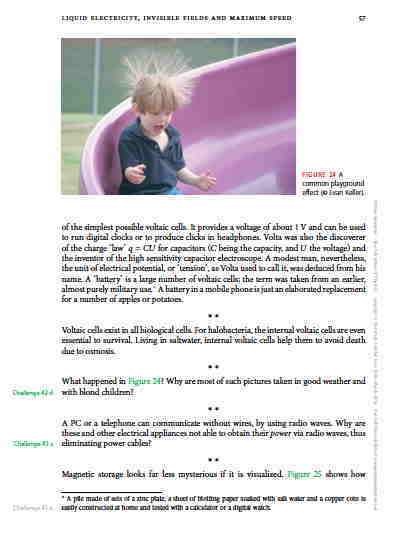 An entertaining and free pdf book on physics - the science of motion. The free English edition has been improved over 28 years. Various volumes are freely available in French, Italian, Japanese, Vietnamese and Spanish. Free download of the 5 pdf volumes of the Motion Mountain Physics Textbook. The 2019 edition, a single zip file with ca. 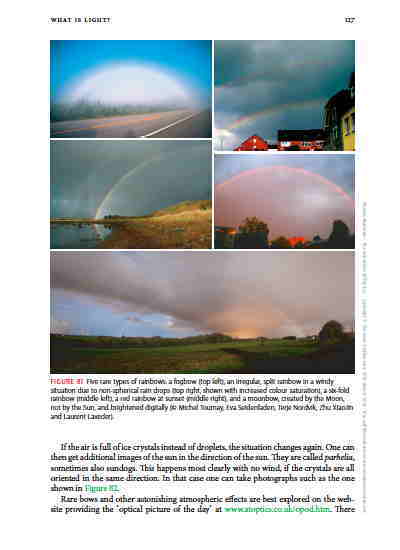 520 MB, is in full colour and contains many films, stories and facts: every page is wonderful and captivating. Explore the motion of plants, animals, lightning, satellites, charges, light and empty space itself! Be fascinated by molecular motors, black holes, the beauty of nature and the simplicity of how it works: Explore the principle of cosmic laziness – least action –, the maximum speed, the largest distance, the highest power, and gauge symmetry, the symmetry that explains electric motors, radioactivity and quarks! 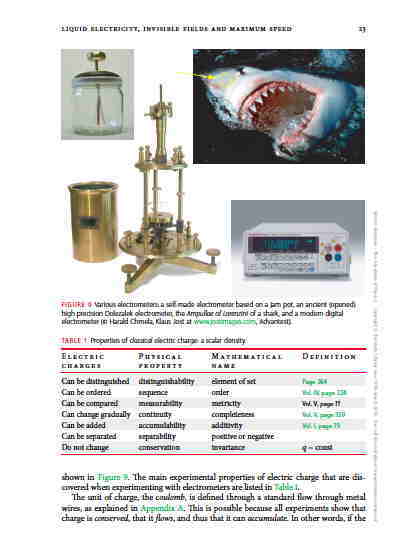 The text is a free physics manual and a free physics workbook, expanding free physics notes that provide a free introduction to physics. But above all, the text is a guide to enjoying physics and nature. Find out what fireworks, mobile phones and butterflies have in common, how muscles work, how colours appear, how levitation is possible, why we can see the stars, and which problems in physics are still unsolved. Enjoy many wonderful puzzles about nature. Read about the great advances in our understanding of the processes that surround us. Learn how the story of the universe shapes our night sky, the Sun, our landscape, our bodies and all the atoms that make it up. Find interesting experiments to repeat. Explore the power of the concepts that are used in physics. If you are between the age of 16 and 106, you will enjoy reading this physics book. These videos show why. If you want even more motivation and an even longer overview of the wonderful stories and adventures that await you, read this section. The volumes of the 2019 edition tell about the new SI unit definitions, show how to rotate a ball glued into a soft mattress for ever and ever - and challenge you to be the first to film this feat; they also show how to create floating images with a simple toy, explain that usual light bulbs produce speeds faster than light when switched on, tell about why it is correct to say that the sun has already set when we see it just touching the horizon in the evening, challenge you to build a high-precision ball-chain (`Netwon's cradle'), show that a formula for pi is hidden in the hydrogen spectrum, provide more fun with quantum physics and colours, tell about noise-producing plants, ask about the Spanish burton and the fool's tackle, present the measurement unit for the spiciness of chili peppers, and present many other stunning images, facts and stories about motion of things, shadows, light, stars, planets, black holes and quantum particles. For a present to others or to yourself, get a paper edition at Amazon (in black & white or in colour), at Createspace (in black & white or in colour), or a Kindle version. Free download of volume I - FALL, FLOW AND HEAT (260 MB). Free download of volume II - RELATIVITY AND COSMOLOGY (50 MB). Free download of volume III - LIGHT, CHARGES AND BRAINS (80 MB). Free download of volume IV - THE QUANTUM OF CHANGE (38 MB). Free download of volume V - PLEASURE, TECHNOLOGY AND STARS (85 MB). Motion Mountain is written for pupils, students, teachers and anybody curious about nature: the text is full of telling anecdotes, captivating riddles, unusual tables, astonishing photographs and beautiful films. It has been downloaded over 300 000 times. Read the volumes online here. Colours and the quantum of change: quantum physics and light quanta. Pleasure and the stars: biophysics, nuclear physics and radioactivity. To read about the strand conjecture, a conjecture on the common description of general relativity and the standard model, go to the research page. Prizes and rewards are offered for solving a number of challenges and for helping to improve the text. are welcome! No profit has ever been made: of the sum spent on the project so far - many tens of thousand Euros - less than a quarter has been covered by donations. If you are in Germany, please support the project by buying through Amazon smile, at no cost to you, by using this link: https://smile.amazon.de/ch/143-219-30760. Free Arabic translations of the first volume on classical physics and of the second volume on relativity are available, admirably translated by Ahmad Bassel Radwan. Free Spanish translations of classical physics and on quantum theory by Jerónimo Hurtado Pérez, and by José Manuel López López on special relativity are available. More volumes are in work. A free Japanese translation of the volume on relativity and cosmology is available, admirably translated by Hirooka Megumi. Free French translations of the three volumes on mechanics & heat, on relativity and cosmology, and on electromagnetism are available – as free pdf or as affordable paper edition – due to the fantastic effort of Benoît Clénet. Free Italian translations of the three volumes on mechanics & heat, on relativity and cosmology, and on quantum theory are available, due to the efforts of Salvatore Spampinato and Alessandro Gori. Free Vietnamese translations of all five volumes on mechanics & heat, on relativity and cosmology, on electromagnetism and light, on quantum theory and on materials and particles are available, due to the fantastic effort of Cao Sĩ Sơn. You are always welcome to expand a translation or to add a new one.